One of the many benefits of the vegan diet is having greater gut health – and, as many health practitioners will tell you, flourishing gut flora is the foundation for vibrant health and wellbeing. By cutting meat and dairy from your diet you are already supercharging your intestinal flora. Numerous studies have found that your belly bug besties — the ones that boost your health — thrive on a plant-based diet. While the bile-loving bugs — the ones that cause inflammation and ill-health — start to take over when your diet is rich in animal fats. Healthy microbiota (gut flora) help our bodies digest and absorb nutrients, synthesise vitamins, rally against intruders, such as toxic cancer-forming carcinogens and can even influence mood and ward off depression. Over time microbiota forms colonies to combat obesity, diabetes and heart disease as well as a long list of systemic illness. You have already given your microbiota a head start by going vegan but here are five awesome cruelty-free foods you can add to your diet that will have the right kind of critters amassing for a block party in your belly. 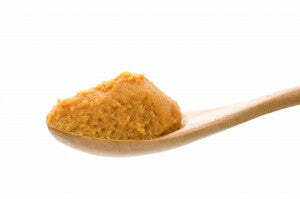 This Indonesian soy product is fermented so it is easier on your digestive system than other soy foods like tofu. Tempeh is a terrific high fibre source of plant protein. The moulds used in the fermentation process produce natural, heat-stable antibiotic agents against some disease-causing organisms. Indonesians who eat tempeh as a regular part of their diet consider it a medicine for dysentery and rarely fall victim to the intestinal diseases to which they are constantly exposed. It brings a great ‘meaty’ element to curries, stews, and casseroles and makes a delicious substitute for a burger patty. This Japanese paste made most often from soybeans (but can also come from chickpeas and can be mixed with grains like rice or barley) is full of nutrients and beneficial bacteria and enzymes. The mixture is allowed to ferment for anywhere between 3 months to 3 years resulting in a delicious paste that is loaded with gut-boosting microorganisms. It provides the base for miso soup but due to its salty nature it is also a great ingredient for healthy alternatives to traditional marinades and sauces — it is a champion in vegan mac’n’cheese! These fermented foods are teeming with beneficial bacteria. 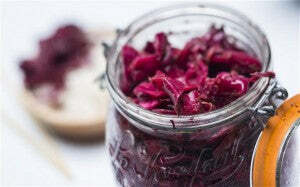 Both of these methods of fermenting cabbage convert your veggies into probiotic powerhouses. You can make them yourself at home very cheaply (there are almost as many recipes online as their are critters in your gut) or you can buy them boosted with additional superfoods at your local healthfood store. 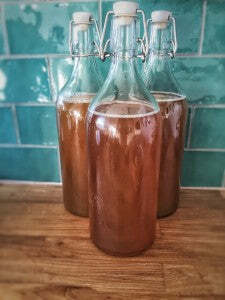 This low-calorie, deliciously fizzy drink is also known as ‘yogi beer.’ A probiotic black or green tea beverage, naturally fermented with a living colony of bacteria and yeast, kombucha can improve digestion, fight candida overgrowth, strengthen immunity, boost mental clarity, and aid mood stability. It is easy to make your own at home but you can also buy an assortment of delicious flavours at your local organic grocer. Jerusalem Artichokes are rich in Inulin Fibre, a strong prebiotic. Once this insoluble fibre travels through our intestines to the colon, it ferments into healthy micro flora. It’s good to ease into eating these gut-boosting tubers if your digestive system is not used to them. There’s a reason this gut health hunter renamed them ‘Jerusalem Fartichokes’ when she first started cooking with them. Other good sources of inulin include asparagus, leeks, onions, and bananas.